Máté Péter brings the pathos. 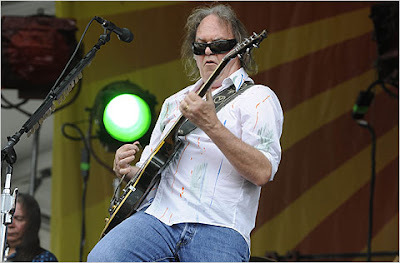 In this amazing photograph, Neil Young looks like a space monster. Although we here at the Little Black Egg don’t like to actually review things, we are happy to strenuously recommend that our readers purchase a particular product. And for those of you who have felt the pull of Balkan rock music but have been unable to find out any information on any of the bands short of that which appears on blogs, wiki entries, or indescipherable online translations of articles in Serbian and Croatian, I would like to recommend that you pick up Guerrilla Radio: Rock’n’Roll Radio and Serbia’s Underground Resistance by Matthew Collin. 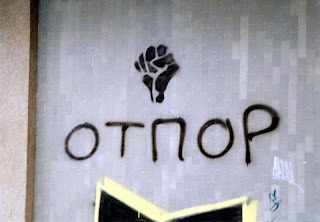 Now, Guerilla Radio isn’t a book on punk rock from the former Yugoslavia, because that book doesn’t exist in English. This is better. Collin’s book examines B92, the Belgrade radio station that was the voice of anti-Milosevic Serbia in the 1990s. It’s totally fascinating, and if you’ve got any interest in YU-Rock, or radio stations, or music, or the Balkans at all, you ought to get a copy. I think I got mine from Amazon for like $1.50 or something unfair and insane like that. 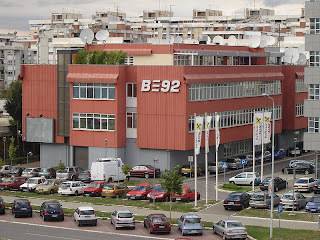 As someone with a keen if amateur interest in this part of the world, I was surprised how little I actually knew about B92 and the resistance it fostered. The huge anti-war, anti-Milosevic movement that rose up in Serbia didn’t exactly have a huge amount of ink spilled about it the Western press. Huge demonstrations that took place against Milosevic occurred in Belgrade, and B92 was a key component of setting the stage for people to feel free to voice their discontent. Amidst state run media organs, B92 basically stood alone as the de facto voice against the regime. It was shut down, its people threatened, and its offices ransacked. The Milosevic regime thought that this tiny radio station posed a threat to their power over the country. They were right. Huge street protests against the government enveloped Belgrade, ultimately causing the Serbian army to send tanks into the streets of the city to disperse the protestors. Collin uses B92 as the lens through which to focus the reader’s attention on the events at this time. This book is succinct rather than exhaustive, which works to its advantage. Collin reported from Belgrade in the mid-nineties, and a lot of the material in this book comes from first-hand interviews conducted with the people who were a part of the events described. I’m no expert, but I haven’t read a better book about this period of time in Serbia’s history. Guerrilla Radio avoids sensationalism and hyperbole completely; instead, it’s a very human, very compassionate look at a handful of extraordinarily brave radio misfits who became, well, heroes. We here at The Little Black Egg suggest you acquire a copy immediately. Šarlo Akrobata were a Belgrade-based Novi Val band active in the early 1980s. They only had one album (Bistriji ili tuplji čovek biva kad...) and it's unbelievable. I'd cut off my hands for a copy of that on vinyl. Hard to know what to say about these guys except, you know, when you gots it you gots it.